Previously we mentioned about the LacunaLauncher that can launch multiple programs with single click, now there is another alternative solution that can offer you similar help with all the programs consolidation under one shortcut icon. 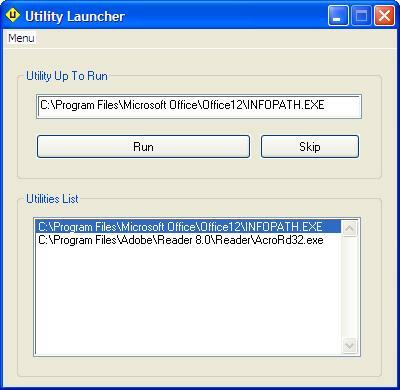 Named as Utility Launch, it can launch multiple programs (up to 20 programs) following the sequence as being added into the Utilities folder list for quick program execution. The software utility is very simple to be used without many steps and configurations needed. Users can just download the zip file at Utility Launcher and unzip it and you will notice two important files: Utility Launcher.exe and list.txt in the folder. Click on the executable file will bring users to a simple GUI that allows them to add Utilities (or any programs) to the list. Users can browse for any numbers (up to 20 programs) of the .exe files and add them into the list.txt and the when the next time users clicking on the executable file will execute the programs accordingly. The software utility is free for download here for immediate use.